When installing or refreshing pavers, weed growth is something to think about. Getting rid of weeds on your patio can seem like a pain, because weeds are experts at finding places to grow. But don’t worry, you’re not defenseless against weeds and other invasive plants. 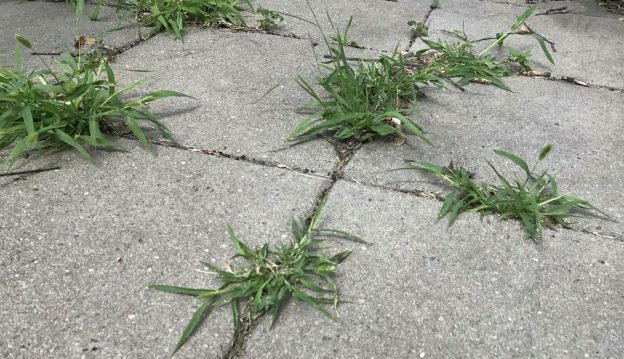 While the best way to get rid of weeds is to prevent them from growing in the first place, there are several ways to remove weeds that have already started to grow on your pavers. Weeds can grow in even the smallest cracks in a patio if no precautions are taken to prevent them. When pavers are properly installed, weeds have a difficult time growing up through the spaces between them. 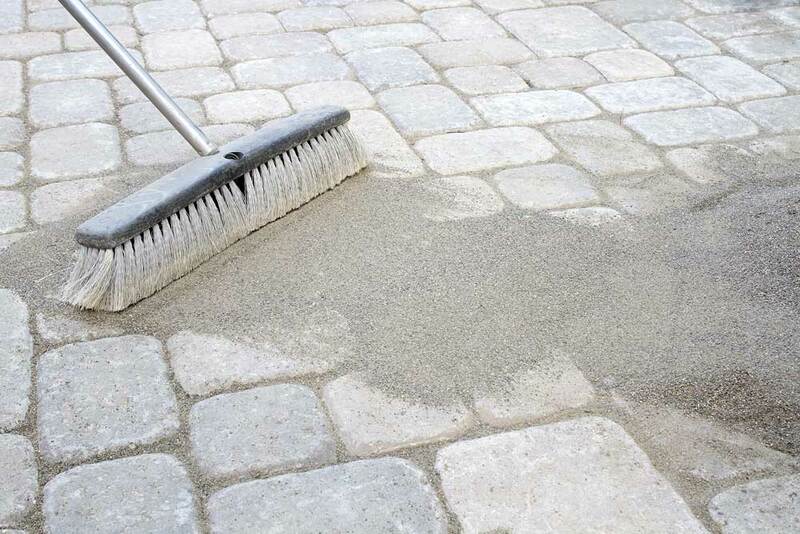 Regularly sweeping and maintaining your paved patio will prevent seeds from settling between the stones as well. Whether you’re putting down new paving or refreshing old paving, there’s a ton of ways to deal with weeds growing between them. Once you’ve already got a weed problem, it can be difficult to take care of, but there are several different ways to resolve the problem in the beginning. Let’s look at a couple of ways to prevent and get rid of weeds on a patio. 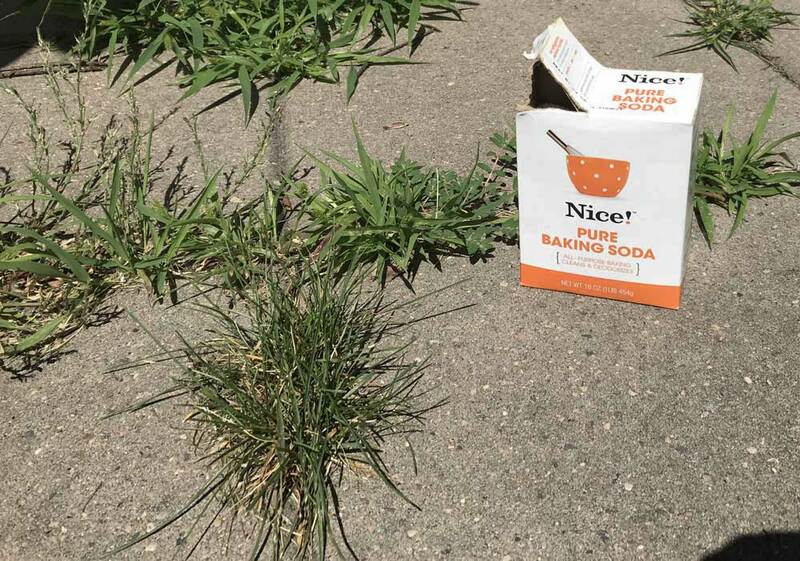 Simple household baking soda may be all you need for your weed problems, especially if you want to kill weeds growing near decorative plants you’d like to keep. Baking soda is a natural product that will not contaminate your property or landscaping and is safe for the environment. Baking soda, or sodium bicarbonate, works by overloading the weed with salt, causing it to dry out all the way to the roots and die. To get rid of weeds with baking soda, moisten them with your garden hose and then sprinkle the soda on top of the entire weed. To prevent weeds from growing in your paving, you can pour baking soda all over the paved area and then sweep into the cracks. You should reapply every four to six weeks. This method works the fastest during spring and fall but can still work during summer. Vinegar, like baking soda, is a natural household product that is safe to use as a weed killer. Vinegar has acetic acid which draws the moisture out of plants causing them to die. Vinegar is extremely fast-acting and will result in a brown, withered weeds within 24 hours. 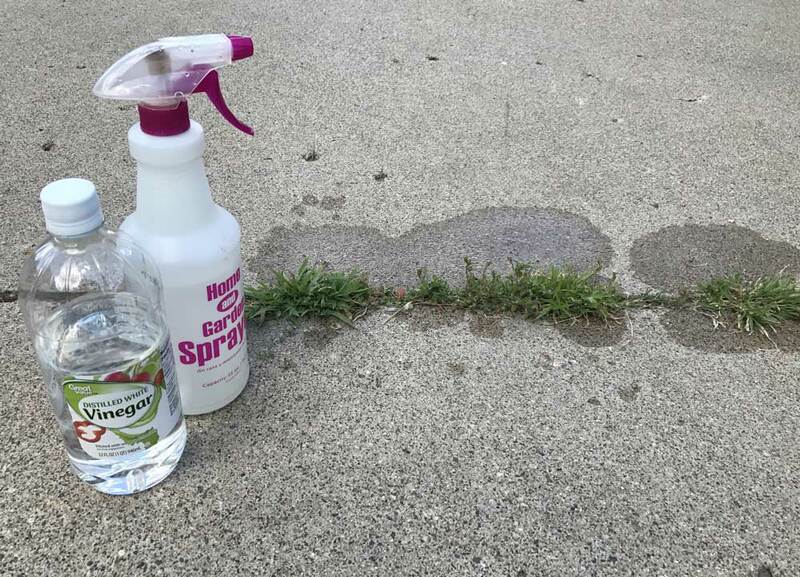 Because vinegar is harmful to all plants it should be applied using a spray bottle ad overspray should be controlled. For longer-lasting results mix 1 gallon of white vinegar, 2 cups of table salt, and 1 tsp of concentrated dish soap and spray on all of the weeds and cracks in the patio. The high concentration of salt in this formula prevents weeds from growing back. Salt is another natural product that you can use to kill weeds. Start by using a 3:1 mixture of water and salt and apply to the area very carefully. Keep in mind that salt water will also kill other plants, so take care to apply it only to the weeds. Like the baking soda and vinegar methods, this is effective since salt dries out the plants to the roots and has a lasting effect. For a low cost solution, you can pull the weeds by hand and then pressure wash the pavers to get rid of roots. For this method to be effective, you should always pull the largest weeds by hand because they’re difficult to remove with a pressure washer. Once the larger weeds are removed, pressure wash around the stones. The goal is to remove debris and sand from the joints while not disturbing the bedding layer that the pavers are resting on. This practice will have to be done regularly to keep the weeds at bay. 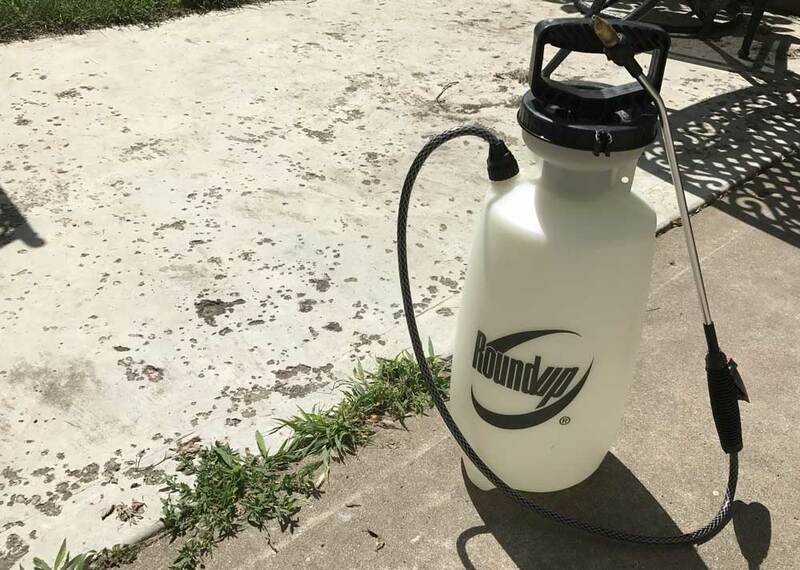 Chemical herbicides can be used to treat weeds on pavers as well, and there’s two general types: pre-emergent and post emergent. Pre-emergent herbicides work on plant seeds and seedlings, and they form a barrier to prevent germination. Post-emergent herbicides work on actively growing weeds and are divided into two categories: selective and non-selective. Selective herbicides can be applied to your whole patio because they target just weeds while having little to no effect on surrounding grass. Non-selective herbicides will kill every type of plant that they touch, so they should only be used in the middle of your paved area. There are several ways to prevent weeds from growing on your patio again. Baking soda, vinegar, and herbicides can all be used to prevent weeds from growing back. Once they leech into the soil weeds will have a difficult time growing. These methods need to be re-applied often to word effectively. Polymeric sand can be used to fill the joints between pavers to lock the joint together and prevent weed growth. Polymeric sand is not ordinary sand, it is a super-fine sand with additives like silica that form a binding agent when mixed with water to better seal cracks between pavers. Polymeric sand also improves the durability of your patio, locking pavers together so that weeds can’t find purchase and grow. Because it’s bonded to itself and the pavers, polymeric sand resists erosion, protecting not only the pavers but also the base materials. Calculate how much polymeric sand you need to prevent weeds on your patio. While it’s hard to get rid of weeds on a patio once they’ve started to grow, you can set yourself up for success when you first install your pavers. You can prevent weeds from even getting a foothold in your patio by using polymeric sand, natural products, or a chemical solution. Be proactive and make your patio weed free from day one!